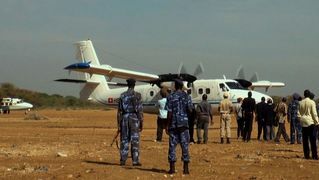 As Peace Talks Collapse in South Sudan, Film Shows “Pathology of Colonialism” Tearing Apart Nation | Democracy Now! filmmaker and director of We Come as Friends. His 2004 film, Darwin’s Nightmare, was nominated for an Academy Award. StoryJan 24, 2014South Sudan Reaches Ceasefire, But Will Nascent State Survive Oil-Fueled Neocolonialism? AMY GOODMAN: Earlier this month, peace talks between South Sudan’s warring sides failed to reach a deal to end a civil war which has claimed tens of thousands of lives in the world’s youngest nation. Last week, the United States proposed implementing a U.N. arms embargo on South Sudan and new sanctions unless the government signs a peace deal to end the conflict. South Sudan is the subject of a new documentary about modern-day colonialism in Africa. Austrian director Hubert Sauper’s We Come as Friends provides an aerial view of the conflict in Sudan from a shaky, handmade two-seater plane. The film depicts American investors, Chinese oilmen, United Nations officials and Christian missionaries struggling to shape Sudan according to their own visions, while simultaneously applauding the alleged independence of the world’s newest state. What emerges is a devastating critique of the consequences of cultural and economic imperialism. The film has just made its theatrical debut in New York and will be opening in select theaters nationwide. BBC Worldwide North America has acquired full rights to film. Well, Democracy Now! 's Nermeen Shaikh and I recently sat down with director Hubert Sauper to discuss We Come as Friends. The film took him six years to make. His 2004 film, Darwin's Nightmare, was nominated for an Academy Award. I began by asking Hubert Sauper about the message he hopes to convey in this new film. HUBERT SAUPER: We Come as Friends is my latest—latest film. The title itself includes already this most cynical line that you can imagine, of somebody trying to take over a land and say, “We are here as your friend. We just want to help,” which is basically the case. And We Come as Friends is a tentatif. I was trying to describe the pathology, the pathological mindset of colonialism, which is not over. It’s still happening. And one of the elements that are very important of colonialism is, of course, land grab, since colonialism is taking the land of someone else, and not only the land, but also the workforce and the control over the people on the land. So, I found this specific story of one specific land grab in South Sudan, as South Sudan became independent, of 600,000 acres being taken away from a local community, basically, by one contract, by one company, by one man, basically, from Texas. And Anuradha and the Oakland Institute had researched it, and I was trying to basically track down—took me a week to find this community in the middle of nowhere. I go there with my little airplane, which I had to make the movie. AMY GOODMAN: Wait, wait, before we continue with this, you can’t just gloss over that. In your previous films, you’re always showing airplanes as sort of a symbol of globalization and also what comes in and out of a country, whether it’s weapons going in and resources going out. But here, you made your own plane. AMY GOODMAN: I think it is rocket science. NERMEEN SHAIKH: It’s airplane science. AMY GOODMAN: Wasn’t it an engine used for a drone? AMY GOODMAN: And he dared to get in this plane with you from your home outside Paris? HUBERT SAUPER: Yeah, he dared, because he knew we’re working on the film, and he’s dedicated to filmmaking. And he was actually sweating and terrified by airplanes, but he learned how to fly over the civil war zone, basically. AMY GOODMAN: You flew from your home in Paris to? AMY GOODMAN: I don’t think it would be allowed in the United States. NERMEEN SHAIKH: It certainly would not be. HUBERT SAUPER: Well, you know, I mean, if I were CIA, I would maybe come up with this kind of ideas, you know, but I’m not working for the CIA. But I don’t want to be hired by them as a—I don’t think they want to hire me anyway, so. But as a filmmaker, what you have to do as a filmmaker is to come up with an idea and to come up with a way to find access to your idea, access to your subjects and access to your locations, you know? And when you want to make a film in a war-torn zone like Sudan, and you start calling the minister of information and say, “Can I have an official invitation?” or something—two weeks later, it’s another minister of information, first of all—second, the minister of information, the old one, asks you for $10,000 for a letter. So you don’t even start doing that. This is—it’s not working. So, basically, you have to come up with some kind of anarchist approach, you know, because it is an area of anarchy anyway. So if you’re not an anarchist yourself, you’re eaten, literally and figuratively, or shot, you know. So, you have to kind of find a way to infiltrate in an environment which is hostile, but which you can still be in, you know? So, how can you—how can you film Chinese oil fields in the middle of nowhere, where there’s no access to roads? HUBERT SAUPER: In Sudan, when all around there’s shooting and civil war. You have to kind of find a way to get there. You have to be friends with the president of China, or you can also just fall from the sky and say, “Well, I’m here, guys. So, I’m sorry, I had to land,” and make friends. And usually, I mean, there are really friendly people everywhere. And when you can make people laugh—you know, like our plane was so small and ridiculous that everyone was like laughing at us, including ourselves. It’s just like a big joke, and it’s kind of a Trojan horse. And the whole thing is a joke, no? And we wore, you know, pilots’ uniforms. At one point—we didn’t do this in the beginning, but at one point we were so harassed by military, every time we landed somewhere, landing as nice guys from France with our own airplane, and they wouldn’t believe us that we were just making a film, so we ended up dressing up as pilots, airline pilots, with four stripes. I put myself four stripes, as a captain, on my shoulders, like the dictators who put their own crowns on. And it was so—it was so ridiculous. And we were just, just laughing. We were just—this is so odd, you know? And then, as soon as we got to the next military camp, the soldiers would salute us, and the commander would invite us for tea, and they would call us “captain.” And so—and so, suddenly, we had kind of mutated ourselves into what I hate most. I can’t stand uniforms. It’s the worst thing. And uniforms, as itself, is a theme of the film, because uniforms is a colonial—is a part of the colonial legacy. The colonizers came up and put, you know, naked people into dresses and uniforms and boots and lockstep, and all this stuff is a colonial—is a part of the colonial legacy. NERMEEN SHAIKH: Let’s go back to the issue of land grabs and play a clip from We Come as Friends. In this scene, a tribal leader in South Sudan comes to understand that he has leased about 2,300 square miles of community land to a Dallas-based company called the Nile Trading & Development Corporation, or NTD. The contract is explained to him by a group of political activists from Juba. NERMEEN SHAIKH: That was a clip from We Come as Friends. The amount of land that was sold, 2,300 square miles, is approximately the equivalent of the greater metropolitan Chicago area. Hubert Sauper, can you talk about that and the significance of these land grabs in Sudan, South Sudan? HUBERT SAUPER: As I said before, that this specific one single land deal, I knew about through the research of the Oakland Institute, which is based in America. And this contract was very officially signed by the government of South Sudan, or Southern Sudan then. And when it became known, through the Oakland Institute, and through the BBC, actually—BBC had made a show about it, a radio show about it—then the [inaudible] government of Southern Sudan suddenly started to be afraid, started to kind of back out, and they said, “Well, it’s not—it was a mistake, and the contract is now neutralized.” You know? But it doesn’t mean that things are now fine; it just means that there’s going to be another contract, another layer of another attempt. You know, it’s not—this specific contract, actually, was—apparently, is out of—is no longer valid, because of the work of the Oakland Institute and because of the BBC coverage of it. That’s it, you know. And me, as a filmmaker, I was there with this group of activists, and we read out the content of the contract to the man who had signed it, who had signed off his land, who was apparently unaware of what he was—had been signing and was kind of forced to sign. And it’s not—and why I used this in the movie is not to kind of denounce the terrifying reality of this very contract. I was trying to make a link to another historic legacy to colonialism, which was the technique of how to steal somebody’s land. Again, King Leopold of Belgium, for example, he was using the services of Morton Stanley, the famous explorer. He sent—King Leopold sent Morton Stanley into the Congo and said, “You sail up the River Congo, and you take all the local chiefs, and you make all of them sign off their land to the king of Belgium.” And those people at that time, 120 years ago, of course, didn’t know how to write, you know? So they put down the fingerprints. The colonialists or Stanley’s assistants would hold their hands and kind of make some kind of signature. And that was the end of many cultures. And it was the end of the life of millions of Congolese, by the way, because then they became forced labor. They had to produce caoutchouc. How do you say? Rubber, for export at the time. And it was just another example. AMY GOODMAN: By companies, by countries. AMY GOODMAN: You talk about China, and you talk about the United States. Let’s go to another clip. This is the U.S. ambassador to South Sudan, Barrie Walkley, speaking at the opening of a new power plant in Kapoeta near the Kenyan border. At one point, his address is interrupted by a protester. BARRIE WALKLEY: —the electricity and close [inaudible]. This morning in the remarks, there have been several references to light. During the opening prayers, reverend father talked about light. The county commissioner, in his remarks, also spoke of the importance of light. The children sang songs of light. Those remarks, those references to light, were literally and figuratively appropriate, because today we are literally and figuratively bringing light. AMY GOODMAN: “Bringing light,” the U.S. ambassador to South Sudan, Barrie Walkley. Describe this whole scene for us. HUBERT SAUPER: Yeah, again, We Come as Friends is a study of the pathology of colonialism. And a lot of things that if you’re a part of a pathology, and all of us, I would say, you don’t necessarily realize the grave—the implication of what you say sometimes, you know? And one of the things that the colonizers did was using religion. The Arabs were using Islam, and the West or, let’s say, the Europe or America were using Christianity as a tool. And the argument of Christianity was we have to bring peace, we have to bring civilization, we have to bring God and light versus darkness. Africa was always referred to as the “dark continent” or the “black continent” or the “shadow land” or whatever. So we were obviously civilized and the light. And these words are so engraved into our souls that the ambassador of the United States speaks it out. He says, literally and figuratively, “We bring light,” saying, “We will electrify your village, and then you will become civilized and not as savage anymore, as you can see”—I’m not saying this, I’m just quoting. So, what is behind it? I don’t know. It’s good intention. I mean, I don’t think—I think it’s an elegant person, this ambassador. You know, he’s doing what he has to do. He works for his country. He brings the good words; he says, “We come as friends.” He opens a power station, electricity in an area, by the way, where people are starving and were dying from famine. In this very proximity of this electric power station, people are dying from starvation, which is not the fault of—I mean, I’m not blaming the ambassador. I’m just saying that these realities are so crazy. And when you think of it, why, of all places, in this very village, Kapoeta, was suddenly an electric power station? And there may be a connection. And I’m just suggesting something, which I cannot prove now. But three-quarters or so of all the reserves of gold in South Sudan—and it’s a huge amount of gold—and three-quarters of that gold is in this very spot, around Kapoeta. NERMEEN SHAIKH: —in colonialism. So, I want to play another clip from We Come as Friends. Here, an evangelist from Oklahoma is preaching to a group of students in his missionary school in that same small town of Kapoeta near the Kenyan border in South Sudan. NERMEEN SHAIKH: That was a clip from We Come as Friends. Hubert Sauper, can you talk about the significance of these American evangelicals in South Sudan? HUBERT SAUPER: Significance. Well, again, you know, We Come as Friends is a film about the mindset of colonialism and about the mechanism of colonialism. And European colonialism was very much accompanied and driven and supported by religious ideas and religious forces and religious people. And so, as it happens today, the center of Africa is being fought over by many empires. China wants the oil. Many Asian countries want the oil. Arabic countries also want land to grow food, because you don’t grow much food in Saudi Arabia, for example. And these countries are a lot of times using religion also to come to certain regions. South Sudan was, par definition, colonized, I mean, by the North Sudan over many years. The North Sudanese governments, Muslim, Islamic regimes, were trying to send Islamic missionaries to South Sudan, were trying to make sure that naked children wear clothes and wear uniforms and march in step. They gave them guns, you know, to fight, etc. And now we, the Western people, are just doing the same. You know, we are sending our missionaries. They are also trying to dress up naked children. They’re trying to make—give them uniforms. We are giving those people arms. And in the reports in the American press and even in the BBC, all you hear is about the Nuer are fighting against the Dinkas, and basically suggesting those savage Africans fight against each other, and now what we have to do is come in, bring the U.N. and bring the missionaries and bring peace. But nobody really talks about the source of the problem is already the presence of money and people who want the oil and people who give the arms to people, to these groups, etc. AMY GOODMAN: And what about the competition between China and the United States? HUBERT SAUPER: The same pattern, same story. You know, the Sudan—the Sudan was split into two countries in 2011. And coincidentally, the new border cuts through exactly through the places where there’s oil. I don’t know why. Can you explain why? The North and the South Sudan are split up, and exactly the new border, which divides—which is, you know, divide and rule is a part of the problem in Africa. Borders are a part of the problem. So this new border was created. It’s 2,000 kilometers long. And as soon as it had been created, it was on fire, because it’s where the oil is. You know, the end of my movie, We Come as Friends, is, by the way, the first—the end of my movie is the first war on the border between the North Sudan and South Sudan. And now, actually, at this point, the South Sudan, in itself, is on fire. And again, two groups and warlords are fighting over—basically fighting over oil. AMY GOODMAN: That’s Hubert Sauper, director of We Come as Friends. The film has just opened in theaters now. This is Democracy Now!, democracynow.org, The War and Peace Report. When we come back, the rapper Boots Riley, artist and writer and activist. Stay with us.